What Is Your Wireworm Risk? With a limited supply of lindane seed treatment left in Ontario, there is growing concern over what options are still available for corn growers to manage their wireworm problem. Are you at risk and what options do you have left for this year? What are wireworms? 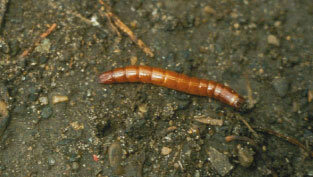 Wireworms are the larval stage of click beetles. As their name implies, these larvae have hardened wire-like bodies that are coppery-brown in colour and are approximately 8 to 35 mm in length (Fig. 1). The adult beetles are usually brown, black or dark grey and make a clicking sound when they flip their bodies to right themselves after being placed on their backs. What can they do to the crop? Only the larval stage causes injury to crops with corn, soybeans, cereals, edible beans and potatoes being those most affected. Injury tends to be more pronounced in wet, cool springs when the seed cannot germinate and establish quickly. Seeds can be hollowed out, leaving only the empty hull, resulting in gaps in the stand. Roots of young seedling plants can be clipped, causing the plant to slowly wilt while older seedling plants may be hollowed out just below the soil surface at the base of the plant. Corn plants may turn purple at the base as a result of their limited ability to take up phosphorous because of this injury. What are the risks? Wireworms can spend up to 6 years in the soil as larvae, with the last few years of their cycle being the most destructive. Feeding activity can begin as early as April, once the soil warms, and continues through to June. Fields most at risk are those with sandy soils, frequent grass crop rotations and history of grassy weeds, or those following a sod, alfalfa or small grains crop. Sandy knolls are especially at risk and should be monitored regularly in the spring. How do you scout for them? The best method to scout for wireworms is to set up bait stations approximately three weeks before planting. Two bait stations should be placed in every high-risk area of the field. Construct a bait station by digging a hole 25 cm deep and approximately 15 to 20 cm wide. Place a few freshly cut potatoes into a loose mesh bag and place the bag in the hole. Loosely mound the soil over the bait station to prevent standing water and place a flag at its position. Securing a dark piece of plastic over the mound will help to warm the bait station, increasing the fermentation of the potatoes, which will be more attractive to the wireworms. Return to the bait station a few days before planting, digging up the bag and examining its contents. If one or more wireworms are found per bait station, control is necessary. What control options are available? In the past, lindane products like Agrox B-3, Agrox DL Plus and DL+C have provided some protection to the seed. With the required withdrawal of lindane products from the Canadian marketplace by December 2004, supplies are limited for 2003. Unfortunately, there are no other products currently registered for seed protection against wireworms. It is important to note, however, that even the lindane seed treatments do not provide protection to the seedling roots. In moderate to heavy infestations, use of seed treatment alone is not advisable and should be used in combination with in-furrow or banded insecticides such as Force and Counter to ensure seedling protection. If bait stations indicate moderate to high infestations, it might be worthwhile to dust off the drill boxes and re-configure the planter for soil-applied insecticide application. There are no effective rescue treatments available once symptoms appear in the field. With or without the use of a lindane product, the best thing that you can do is to plant your seed in optimal conditions. Without a seed treatment, it is the seed that is most vulnerable. Avoid seeding too early and planting too deep. Give the plants the best opportunity to get established and growing quickly to minimize the impact of wireworm feeding. Once the seedling is established, soil-applied insecticides, if used, will provide the protection needed. Also, increasing your seeding rates by 10-15% in high risk areas of the field may help to compensate for some stand loss that may occur in those areas. The good news is that seed treatments coming to market shortly (i.e., Cruiser, Gaucho and Poncho) do provide excellent control of wireworms and other soil insects. The 2003 growing season might be a challenging one for some, but by knowing what your risk is in your fields, you can be better equipped to make the proper decisions necessary to help reduce this risk.